1910 T209 Contentnea Photo Series Baseball is the second installment of T209 cards. While the black-and-white images are not as visually appealing as the color lithographs of the T209 First Series, the extensive checklist and general rarity make it an intriguing under-the-radar set for vintage collectors. Generally referred to as Photo Series, T209-2 or Type II in order to differentiate it from the T209 Contentnea First Series cards, the two sets are quite different. Where the first series was a color issue of just 16 cards, the Photo Series release is much larger and made up of black-and-white photos. And while both series releases advertise that players from three minor leagues are covered, the Photo Series is the only T209 set to feature the Virginia League in addition to the Carolina Association and Eastern Carolina League. Cards in 1910 T209 Contentnea Photo Series Baseball are slightly bigger than the First Series set, measuring 1-5/8" by 2-3/4". It is believed that the T209-2 set was released after the T209-1 series, once it was determined to be far too expensive to continue with lithographs. However, several of the players from the First Series have cards in the Photo Series, so it's doubtful it was meant to be an actual extension of that set. 1910 T209 Contentnea Photo Series Baseball fronts feature a black-and-white photo surrounded by a white border. Some cards showcase portrait shots, while others feature full-length poses. A white box within the picture contains the player's name and team city. 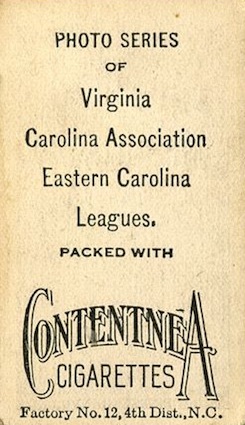 Similar to the First Series, the Photo Series cards feature a basic advertisement for Contentnea cigarettes and mention the three leagues by name. Unlike the earlier release, most of the T209-2 cards do not contain stamped factory information as it was printed on like most of the other tobacco cards of the era. While the set is over a century old, there is sill some dispute about the actual number of cards in the set. Full 1910 T209 Contentnea Photo Series Baseball checklist numbers range from 220 to 226 cards and remain uncertain because of unverified cards and the possibility that more cards could be uncovered. In any case, the set is tough to put together and examples are sometimes much more expensive due to competition among set collectors. 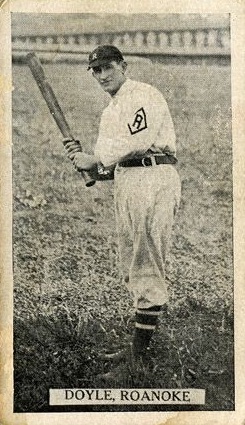 Although there are no star names in the 1910 T209 Contentnea Photo Series Baseball checklist, nearly 30 of the players spent time in the majors. 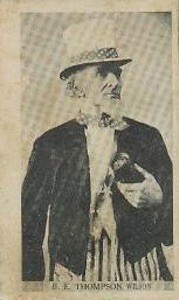 Perhaps one of the more intriguing additions, B. E. Thompson was not a baseball player but was still included in the set dressed as Uncle Sam. The card also has a different back than the rest of the set. Additionally, two players were featured on one horizontal card. 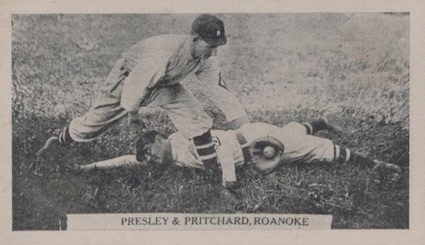 While multiple subjects on the same card is not uncommon in 1910 T209 Contentnea Photo Series Baseball, this is the only card to list both players on the card by name - Presley & Pritchard. One notable miss is Jim Thorpe, who played for two Eastern Carolina minor league teams during the 1909 and 1910 season. More recently, a previously unknown Photo Series souvenir album surfaced at auction, selling for just under $30,000. The album was meant to house the majority of the T209-2 cards by team, but not all the known cards had designated spots. 224 cards. Shop for base cards on eBay. The cards are listed in alphabetical order by last name.